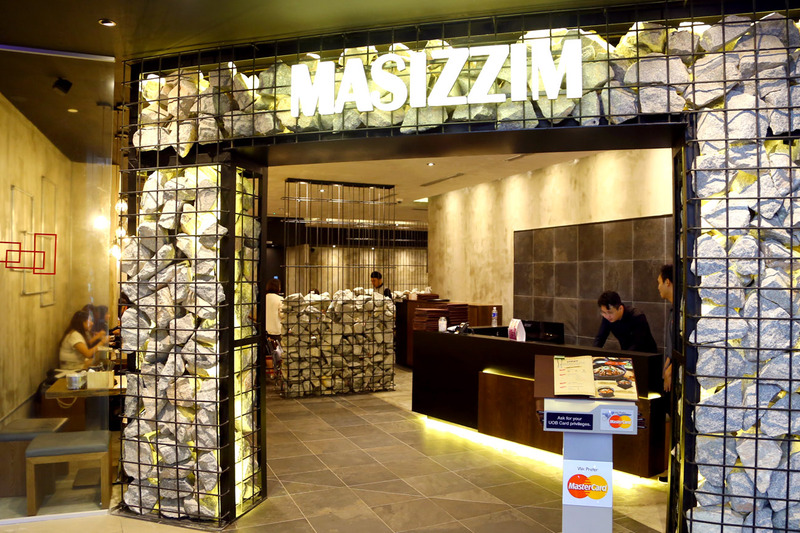 “Let’s Go To Try Masizzim!” Another Korean food trend has hit Singapore at 313 Somerset. 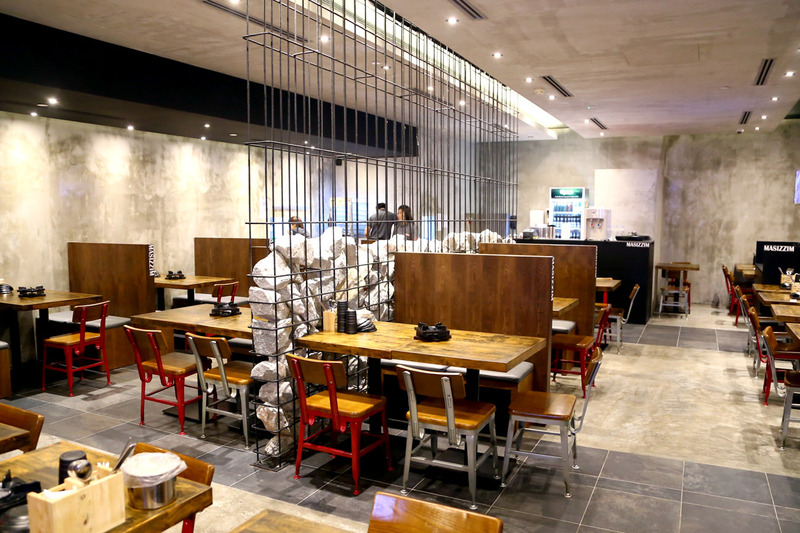 This is of a different kind, specializing in Korean meat stews and pancakes. 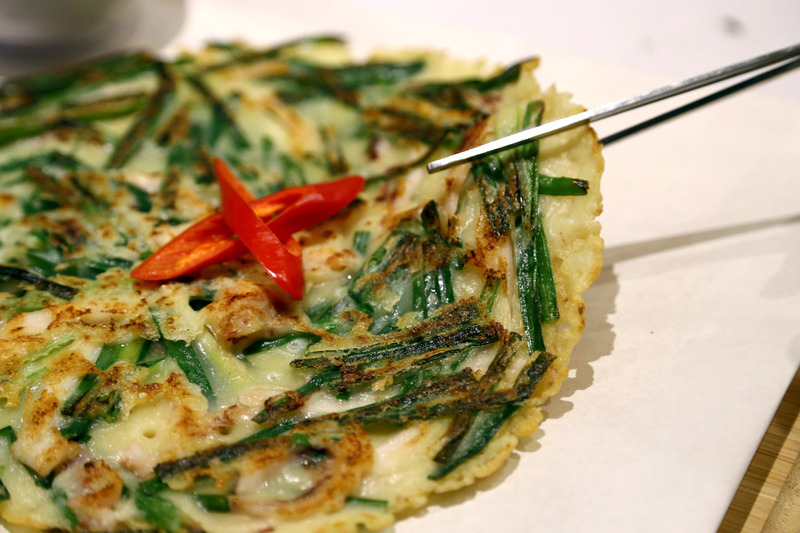 I sense some of you are getting as excited as my Korean cuisine foodie friends whom I gathered for this meal. 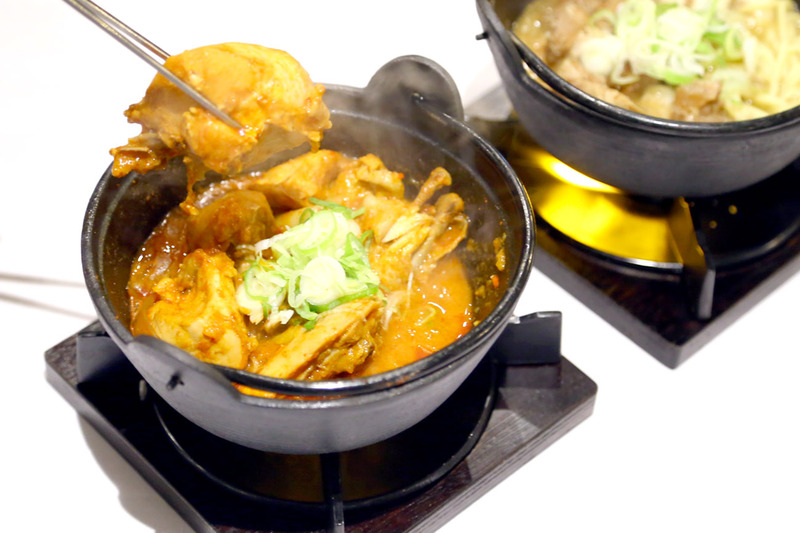 Masizzim (pronounced ma-see-zim, hard to spell, I know) is the combination of two Korean words – ‘masi’ which is short for ‘delicious’ and ‘jjim’ for stew. 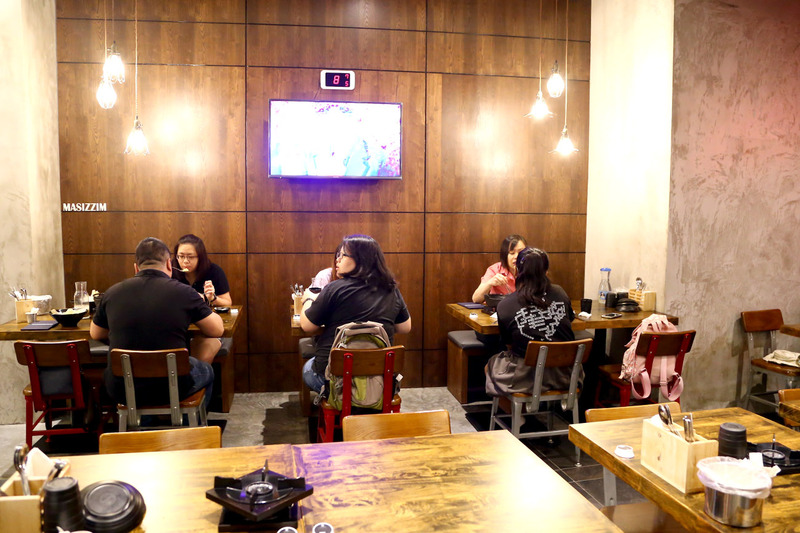 The hip casual restaurant is right next to popular Korean fried chicken shop Chir Chir, serving modern dishes at quite affordable rates friendly to the pocket. Of the three types of meat, we liked the pork best as the Australian mixed pork ribs were marinated overnight, slow-cooked in Masizzim’s secret sauce for at least six-hours, then served hot in cast-iron pots with flames, staying hot throughout the meal. 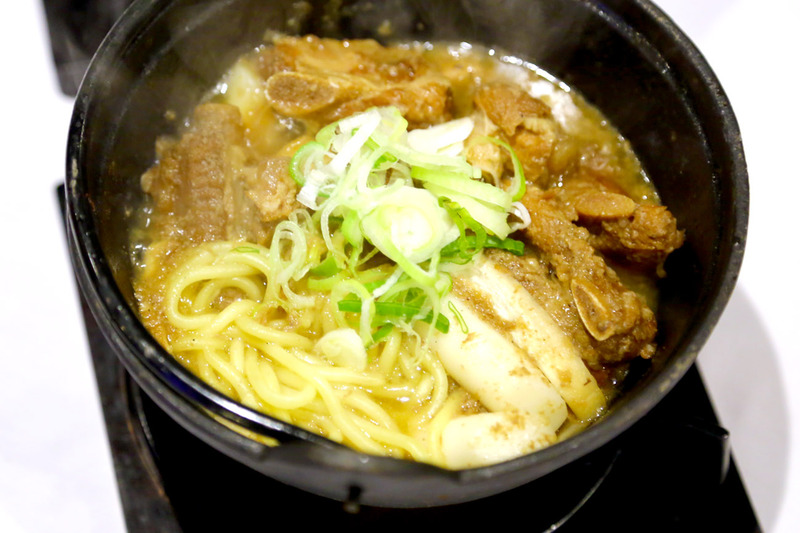 The pork was SO SOFT and TENDER that they fell off the bones easily. I am kind of careful eating pork ribs on other occasions because I get irritated by the feeling of having some meat get stuck between the teeth. No such problem with this. 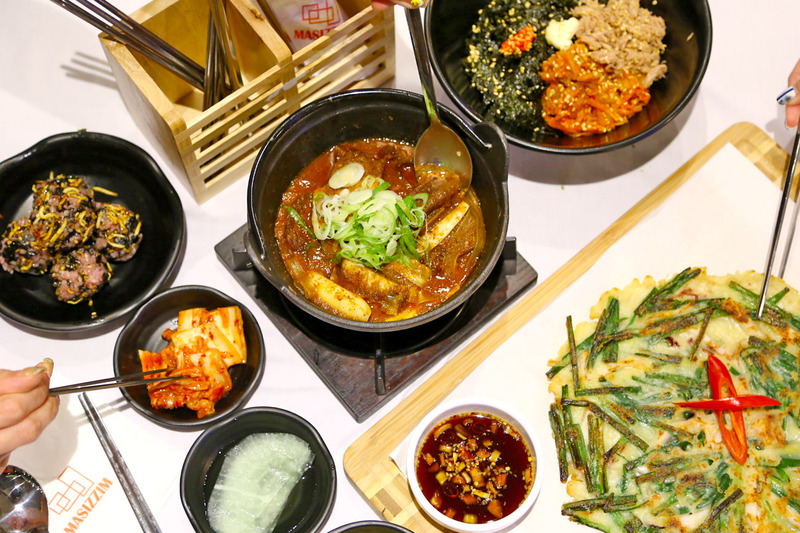 Surprisingly, for a spice lover like myself, I enjoyed the non-spicy soy flavour best, with slight sweetness coming from pineapples and Korean pear. 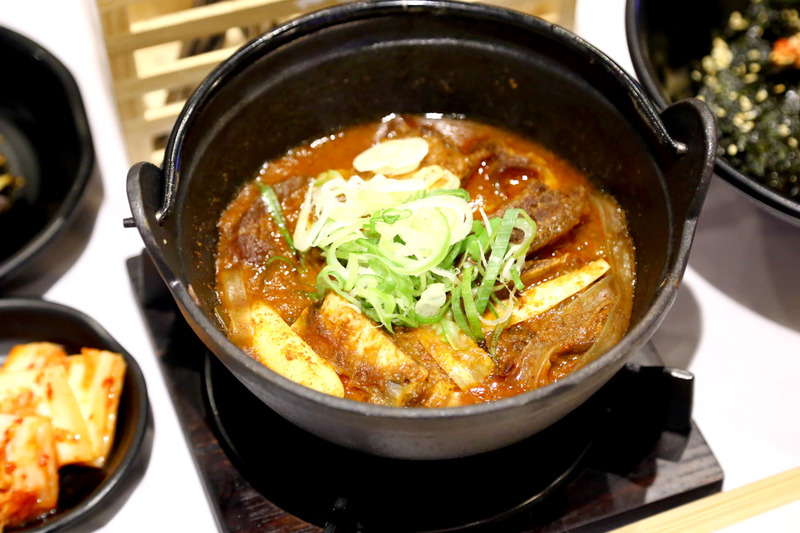 The sauce reminded me of a stew my grandma used to it, that I would pour the gravy plentifully over plain rice. Yup, those type. The girls were divided over the Level 4 spicy sauce. Em yes, I purposely ordered that for a ‘challenge’. My personal recommendation: If you want to relish both the taste of the sauce and still get a kick, get the Level 2. But your choice. 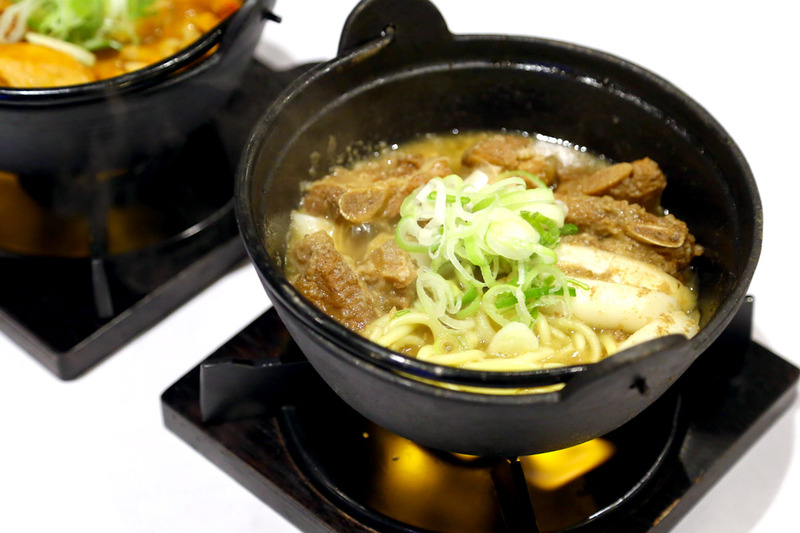 This is a fun dish to have, and you have to ‘work’ for it. 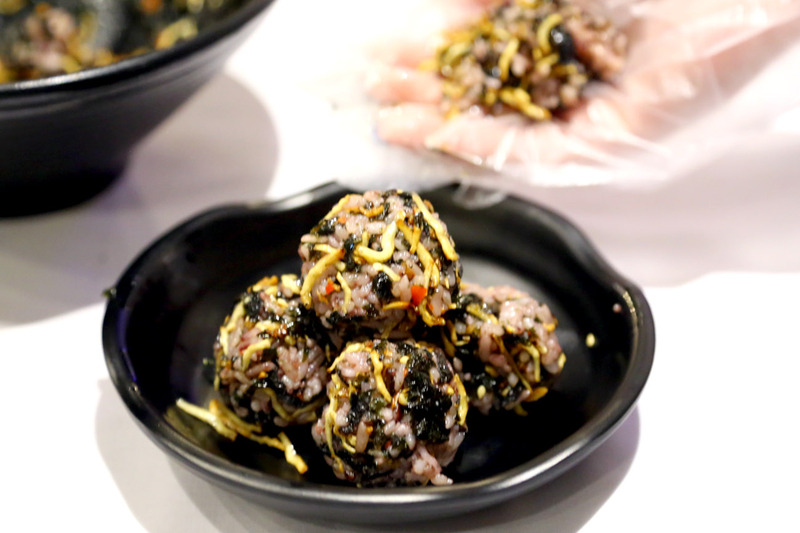 The Masizzim Rice Balls ($8) would arrive in a bowl of Anchovy or Tuna flavour (Anchovy more delicious yah?). 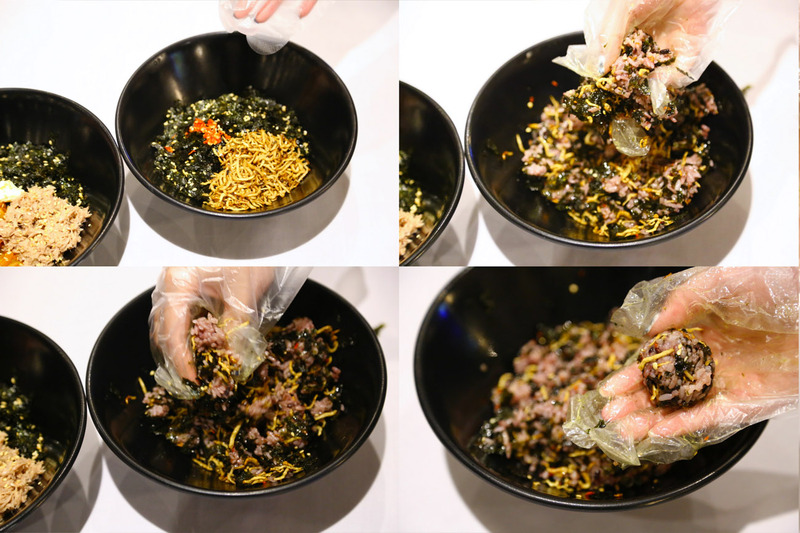 After which, you have to put on some gloves, mix the ingredients up, and mould them into rice-balls. My cutesy friends were more on-the-ball (pun not intended) and rolled big-heart shaped ones, while I just wanted to eat. I could imagine this whole process could help in bonding (Reminding me of times I made rice kueh kueh much younger). The Anchovies Rice Balls were easier to shape, and I liked there were different types of chewy medium-grains, with a touch of crispy salty anchovies for that light crunch every bite. Making those anchovy rice balls. Ta-dah. 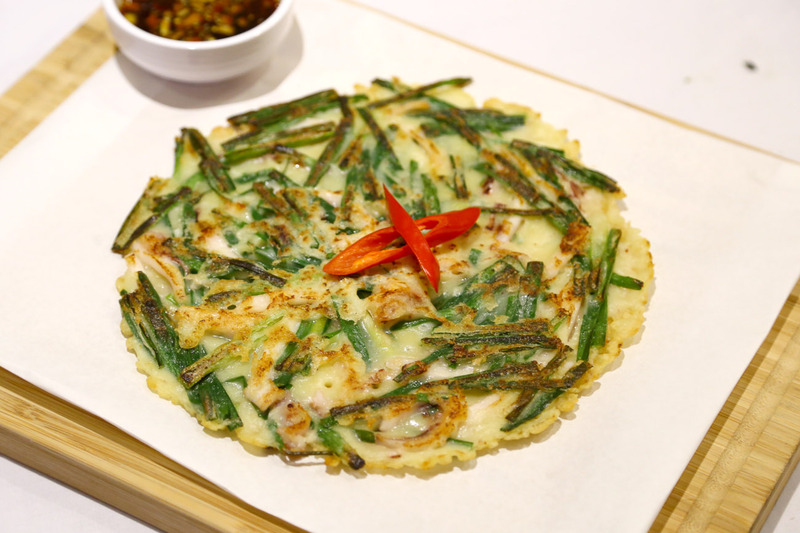 There were 3 types to choose from – Squid & Leek ($14), Tomato Cheese Kimchi ($13) and Potato Pancake ($12). 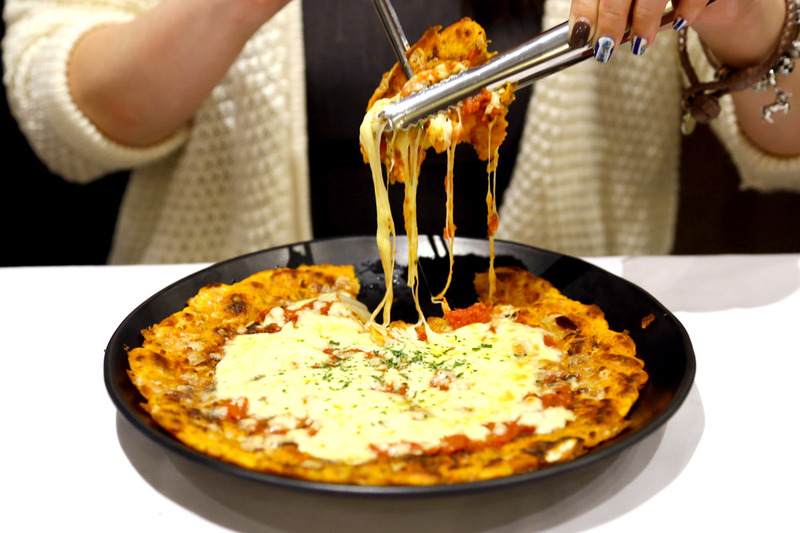 The Tomato Cheese Kimchi could taste like a cross between a Korean pancake and Italian pizza, as it has minced beef-infused batter with tomato paste, AND gooey cheese mozzarella. Quick tip though (although slightly ironic): Eat your pancakes while they are hot, ie don’t take too many pictures. 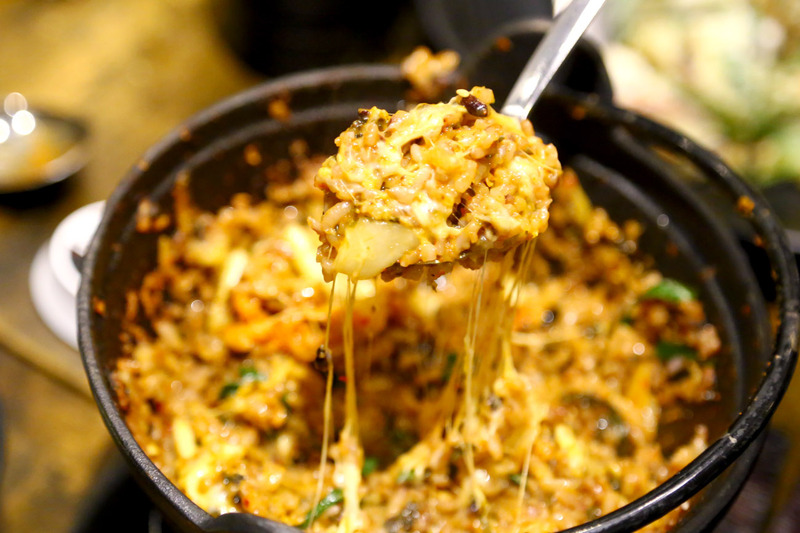 IF you have space, and both kimchi and cheese are your thing, then you won’t want to miss out the Spicy Cheese Kimchi Fried Rice ($8) which has mixed grain rice fried with kimchi and rib stew sauce, further topped with mozzarella cheese. Maybe you will find that space. Don’t say “Bojio”. *This entry is brought to you in partnership with K Food Holdings.